Break the spaghetti into lengths of about 5cm/2in and boil in salted water until al dente. Drain and toss in a few drops of olive oil to prevent sticking. Melt the butter in a heavy saucepan and add the flour to make a roux. Cook for a minute or so,then add the hot milk, stirring until you have a thick, smooth bichamel. Allow to simmer gently for just a minute. 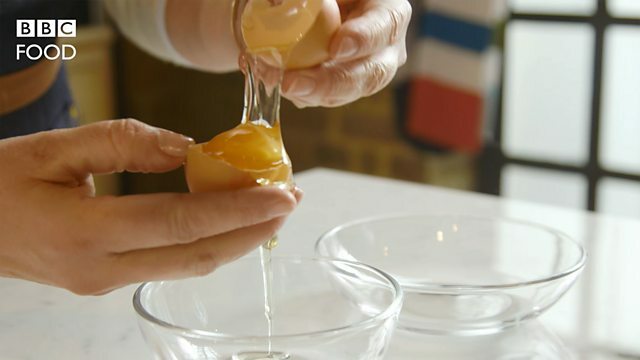 Whisk the egg whites until stiff and fold gently and thoroughly into the mixture. Divide between four small souffli dishes (or two medium, or one large) and cook in a preheated oven at 170C/325F/Gas 3 for about 20-25 minutes until well risen and golden.